This is the latest shirt idea that we are conjuring up for a special valentines day, it is still in the process, we are not even sure if its going to get printed but we would like to give you an idea of what is going through our heads. We are not sure about the colors or details yet. We might stick some special embroidery in there. 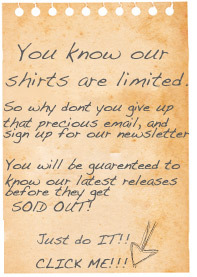 It is definitely going to be printed on our super soft shirts , that is for sure. Keep checking back for updates and our new shirt ideas. « New Shirts Coming in January!